There are 1375 SNPs for the human CYP2C9 gene listed in the National Center for Biotechnology Information SNP database (http://www.ncbi.nlm.nih.gov/SNP). 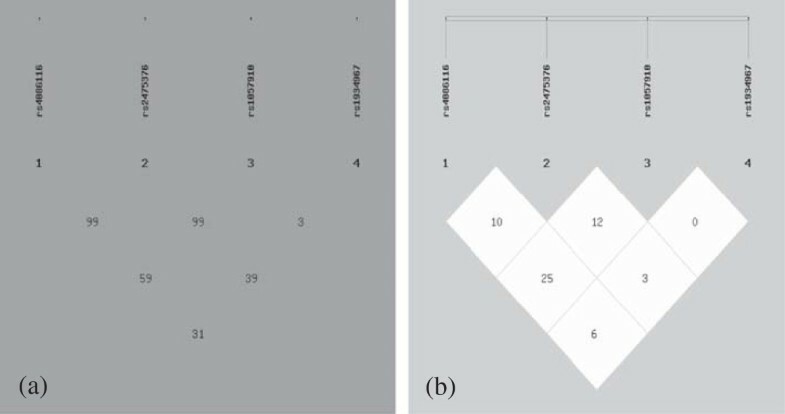 Using the Haploview 4.2 software and the HapMap phrase II database, we obtained four tag SNPs (rs4086116, rs2475376, rs1057910 and rs1934967) by using minor allele frequency (MAF) > =0.01 and linkage disequilibrium patterns with r2 > =0.5 as a cut off. 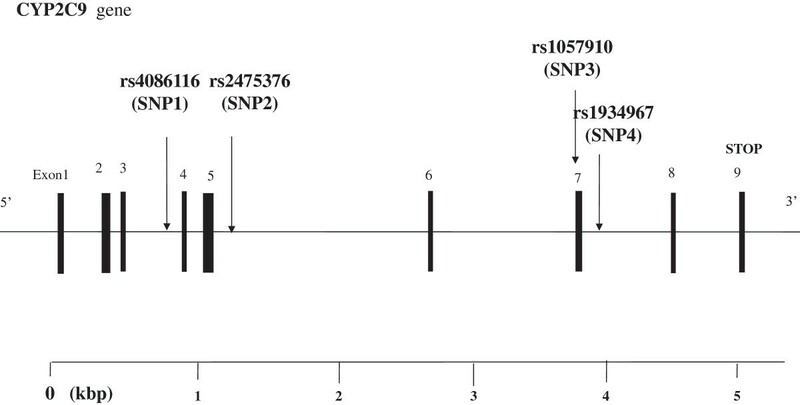 We designated these SNPs as SNP1, SNP2, SNP3, and SNP4 (rs4086116, rs2475376, rs1057910 and rs1934967) in order of increasing distance from the CYP2C9 gene 5′end (Figure 1). SNP1, SNP2, and SNP4 are located in intron. SNP3(rs1057910) is located in exon7, and had a non-synonymous substitution amino acid change, which is defined by an A-to-C nucleotide substitution that leads to an exchange of leucine by isoleucine at amino acid position 359.